Semantic networks are an extension of the concept of the directed graph. They are graphic representations of knowledge using patterns of interconnected nodes and links. Semantic networks were first developed for artificial intelligence and machine translation, but earlier versions have long been used in philosophy, psychology, and linguistics. In other words, semantic network links may have several predefined link or relation classes. This is in contrast to typical directed graphs, which have only one predefined link or relation class. By allowing many classes, semantic networks provide better descriptions of knowledge and information than directed graphs. Figure 17. 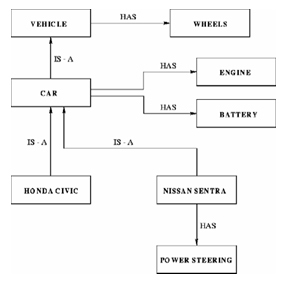 A basic description of the concept of a car using a semantic network. Semantic networks provided the impetus for the development of concept maps, mind maps, and topic maps. The index is a collection of terms representing the relevant subjects explicitly or implicitly covered by the text. The index is a surrogate for information, a kind of semantic fingerprint of the book’s content. The index is a result of an intellectual process in which a human (the indexer) selects only those subjects from the text that are – in the indexer’s opinion – relevant to the target audience. Complex metadata. For example, a topic map can contain information about information resources. A link network. Topic maps are well-organized link networks, helping to avoid the “lost-in-hyperspace” syndrome that is caused by human minds being unable to cope with a large volume of nodes with identical relationships. The classification of relationships provided by a semantic network allows humans to break down complex networks into types and sub-types for easier understanding. Knowledge structure. Topic maps are a base technology for explicit knowledge modeling. Abstract subjects, which have as characteristics names, resources, and relationships, are called “topics.” A very powerful and useful capability of topic maps standard is scoping of topics. However, some characteristics are broadly applied while other characteristics have limited applicability and differ in meaning within “scopes.” For example, the characteristic “softness” may have a different meaning for the scope of a musical instrument than it does in scope of material knowledge. The scoping of topics may help when defining different access rights to users or presenting different points of view of interest to that user. When compared to graphs and trees, the weakness of topic maps is that they poorly display the context and overall structure of the information or knowledge being presented. Indeed, topic maps allow for only one subsequent level of linkage though the use of synonyms and associations. The alphabetical order of topic maps makes searching for known topic names easier. This feature could also be implemented in trees and network graphs using supplementary index tables. 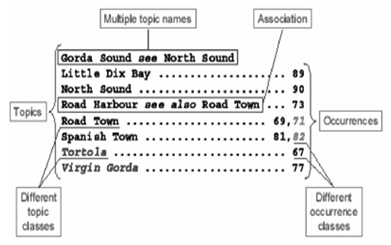 Synonyms and associations act as cross-links, which are also common with graphs. They contain different topic classes and different occurrence classes, which could also be implemented in graphs and trees using colors or other graphic elements. ISO Standardization and XML representation via XTM standing for XML Topic Map format. Another feature is the ability of topic maps to merge topics that, through Uniform Resource Identifiers (URI), are identified as having the same subject. In essence, two topics with the same subject are replaced by a new topic that unifies the characteristics (names, occurrences, and associations) of the two original topics. Indeed, there exists a standardized procedure for automatically merging topic maps. Topic maps allow users to find information by giving every concept its own identity and providing multiple, semantic navigation paths through the information space. Because topic maps allow users to know where they are in relation to a body of information, Charles Goldfarb called topic maps “the GPS of the information universe.” Indeed, topic maps form the backbone of Wikipedia and many other online content management systems. For more information, or to work further with topics maps, the following software may be useful to create, manipulate, and visualize topic maps. Leading commercial products include: Ontopia, NetworkedPlanet, Mondeca, and Emplois. There are also many free and open-source packages and solutions, web-based scripts, and stand-alone code libraries and applications, such as TM4J, SemanText, GooseWorks Toolkit, K-Discovery, TM3D, and xSiteable. Another topic maps standard is Resource Description Framework (RDF). Although some say RDF is simply a variety of topic maps, it is a family of World Wide Web Consortium (W3C) specifications that, designed as a metadata model using XML, introduced valuable additions oriented for the most part to Internet applications. Through a variety of XML- and non-XML-based syntax formats, RDF has come to be used as a general method of modeling knowledge. Because describing mechanisms for resources is a major component of RDF, The W3C proposed the so-called Semantic Web recommendations. This represented an evolutionary step in the World Wide Web, one in which automated software could store, exchange, and use information in a machine-accessible format, and distribute it throughout the Web. This, in turn, enabled Web users to more efficiently access information. RDF’s simple data model and ability to model abstract concepts has also led to its increasing use in knowledge management applications unrelated to Semantic Web activity. The primary idea behind RDF is making statements about resources in the form of a subject-predicate-object expression, called a “triple” in RDF terminology. For example, the representation of the fact “The car has an engine” would be as a triple in RDF, where the subject is “the car,” the predicate is “has,” and the object is “an engine.” Predicates are actually traits of resource’s connections and express the relationship between the subject and the object. In this manner, a collection of RDF statements represents a labeled, directed graph. Topic maps provide a resource-centric view, one in which metadata is used to describe the resources referenced, as well as a subject-centric view, in which topic maps provide the tools necessary to represent subjects. These views, when coupled with the ability to unify topics through merging, provide a useful tool for global knowledge interchange. Today, the most common use for topic maps is in building web sites that are topic map driven, in order to reap the benefits of searching, visualizing, and organizing information. The topic map provides the site structure, while the content of the site is taken partly from the topic map itself, and partly from the occurrences that point to actual resources. This approach is applicable for content management systems, portals, catalogs, site indices, and so forth.